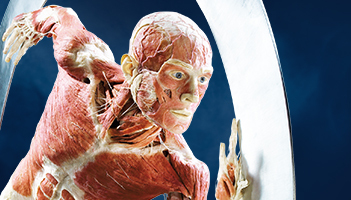 BODY WORLDS takes visitors on an unforgettable journey into the human body. 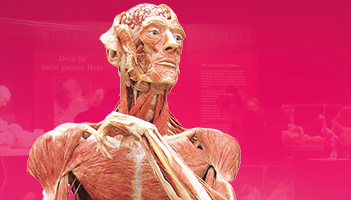 The unique exhibiton provides fascinating insights into the body’s complex structure and explains how functional systems and organs interact. Visitors will find that the exhibition experience goes much further. By looking into the inner body of a stranger,they will discover their own in a complete new way. 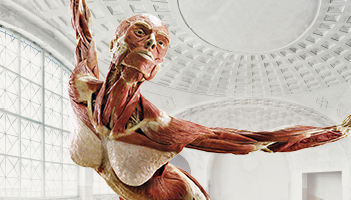 BODY WORLDS does not only focus on conveying anatomical knowledge. The exhibition aims to inspire visitors to live consciously, to pay more attention to their health, to recognize their physical potential and limitations, and to reflect on what is means to be human. 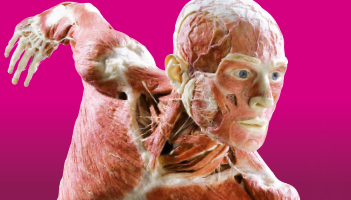 BODY WORLDS explains in an easy to understand way how the different systems of our body work in sync, so that we remain healthy and live to our potential. From head to toe, a wide network of delicate nerves regulates all body functions. The nervous system controls hundreds of activities simultaneously. It is the source of our consciousness and it allows us to communicate and perceive emotions. Some functions, such as breathing and digestion, belong to the autonomous nervous system and cannot be voluntarily controlled. The cardiovascular system distributes nutrients, oxygen and hormones to the various parts of the body, and at the same time collects the waste products from metabolism in order to excrete them. The heart is the motor of this system and the dense network of blood vessels forms the transport routes. Our life requires the continuous supply of oxygen, which we take-in through breath. Without oxygen, most body cells could only survive for a few minutes. The respiratory organs allow for gas exchange in the lungs,, oxygen is inhaled and carbon dioxide is released. Running, biking, swimming - all these activities are possible through the sophisticated interaction of bones, muscles and joints that keep our body upright, flexible and in motion. All processes in our body need energy that we retrieve from food. In order to convert it into energy, food must be fragmented down into its components. The organs of the digestive tract split the food both mechanically and chemically and allow nutrients to pass into the blood and with this, into each individual cell. The exhibitions are continuously supplemented by current topics. The Cycle of Life presents the body as it grows, changes, matures and wanes. Every stage of development is documented, from conception thru optimal adult health and athleticism to eventual decline. The exhibition delivers a breathtaking encounter with the inner workings of the human body and shows the effects of poor health, good health, and lifestyle choices. Happiness resides within us. This exhibition shows how our bodies act as the control center of our happiness. On the one hand, a feeling of happiness is the result of certain neurotransmitters and hormones being released by the body. On the other hand, we experience these feelings of happiness with our bodies. Both happiness and a lack thereof immediately affect our bodies. Studies have shown that if you are satisfied with yourself and your life, you are likely to be sick less often, and are likely to live longer. Vital celebrates the potential of the human body and the body in motion. Featuring authentic human bodies, the exhibition shows the body in health, distress and disease and tells the pressing story of how best to defeat help prevent some life-threatening diseases, such as cancer, diabetes and heart ailments, though informed choices and healthy lifestyles changes. The heart is the steadfast engine of our life. Due to this continuous strain it is also susceptible to wear and tear, and to dysfunctions. Diseases of the cardiovascular system are the leading cause of death today. This exhibition encourages the visitor to live a more heart-conscious and heart-healthy life. A convergence of anatomy, health and wellness, this special exhibition presents the body in health and distress, its vulnerabilities and potential, and many of the challenges the human body faces as it navigates the 21st Century. Rx – Prescriptions for Healthy Living is designed to explore the intricate biology and physiology of human health and the dramatic effects of contemporary diseases, including back pain, arthritis, cancer, obesity, heart infarctions, dementia, and more. The exhibition will inspire audiences to embrace preventive healthcare through an informative and entertaining presentation, of the latest research on top health issues. This trio were ‘actors’ in the James Bond film, Casino Royale. Their presentations differ as much as their poker playing strategies. In the poker player on the right, both parietal bones were lifted up to make the brain visible from behind. The brain was horizontally sectioned and folded out. Beneath it is the cerebellum, below the spinal cord is visible inside the opened vertebral canal. In the poker player on the left, the abdomen was opened, yielding a view of the intestinal loops. The unusual and striking head of the poker player sitting in the middle was created by separating the frontal bone, the nasal bone, and both cheekbones from the posterior skull bones. Plastination allows for completely new kinds of anatomical dissections, such as dissection by expansion. Here, like an exploded view, anatomical structures are opened up and shifted apart. This creates artificial spaces, allowing all organs in the body to be viewed, even if they naturally would overlap or cover one another. This plastinate shows the interplay between surface and intermediate muscles when they work together in movement. The skeletal muscles vary in shape and strength. Visitors can clearly see why the muscles that surround the spine are some of the most powerful ones. This plastinate refers to Rembrandt’s famous painting ‘The Anatomy Lesson of Dr. Tulp’ which shows the Dutch surgeon and mayor of Amsterdam dissecting the forearm of a corpse. BODY WORLDS: The Original Exhibition, is the first exhibition of its kind to inform the visitor about anatomy, physiology and health by viewing real human bodies preserved through Plastination, the preservation process invented by Dr. Gunther von Hagens in 1977, while he was working as an anatomist at the University of Heidelberg. Since the beginning of the exhibition series in Japan in 1995, more than 44 million visitors in over 90 cities in Asia, Europe, America and Africa have seen the world's most successful traveling exhibition. Anyone interested in learning what makes us human. Adults of all ages and children will find the exhibits fascinating. Given the nature of the BODY WORLDS exhibits, it is up to parents, guardians or school staff to decide whether BODY WORLDS is appropriate for the children in their care. Why is it important for the public to see these exhibitions? The organizers of BODY WORLDS believe that when people understand more about how the body works and how it can break down, they are more likely to choose healthy and sustainable lifestyles. We also hope it will inspire visitors to learn more about the life sciences. Knowledge about what the human body looks like and how it functions is basic life science information that should be available to everyone. During the run of the exhibition, we will be actively reaching out to educators and medical professionals to ensure that they have the opportunity to experience the exhibition. Why are the plastinates posed the way they are? The poses of the plastinates have been carefully thought out and serve educational aims. Each plastinate is posed to illustrate different anatomical features. For instance, the athletic poses illustrate the use of muscle systems while playing sports. The poses are chosen to highlight specific anatomical features and allow the visitor to relate the plastinate to his or her own body. Would I be able to learn just as much from books or models of the human anatomy? The use of authentic specimens allows a penetrating examination and study of disease, physiology and anatomy unmatched by models, textbooks or photos. In addition, the exhibition allows visitors to understand that each and every body has its own unique features, even on the inside. The experience in other cities has clearly demonstrated that exhibit visitors are drawn to real specimens in a way that cannot be replicated by models. How do the various exhibitions that are being shown differ from each other? While all of the BODY WROLDS exhibitions focus on general anatomy revealed through Plastination, each exhibition is currently being shown with dedicated themes—on cardiology and the heart (BODY WORLDS & The Story of the Heart), human development, longevity and aging (BODY WORLDS & The Cycle of Life), the body´s capability and vitality (BODY WORLDS Vital), and the story of the human body in the 21st century (BODY WORLDS: Pulse), the influence that ‘happiness’ has on our health (BODY WORLDS: The Happiness Project) and the prescription for a healthy life (BODY WORLDS RX). The exhibitions show a multitude of brand new plastinates and offer every visitor—even the ardent BODY WORLDS visitor—a fascinating exhibition experience.